Well, Dr. Davidson, your comment on the previous blurt has spurred me. And here’s what I’ve discovered. These data are from the NOAA (odd that it could be pronounced Noah, since we’re talking about sea level rise and the concomitant effect on human populations). Record-breaking daily high temperatures for the month of June in the US as a percentage of the total number of observations. Data taken from http://www.ncdc.noaa.gov/extremes/records/. This scatter, minus the usual eye-controlling regression line, is a portrait of the US June record-high temperatures since 1906. I’ve chosen to represent the data as percentages of stations reporting. It’s clear from the raw data that the reason we’re hearing alarming absolute numbers of record-breaking temperatures has more to do with the absolute increase in numbers of stations reporting to NOAA than with any real intensification of temperature records. In 1906 there were just 15 stations for which there were observations. By 1953 there were 75,399 stations reporting in June. In 2012 there were 171,442. I’m a little bemused by these data. 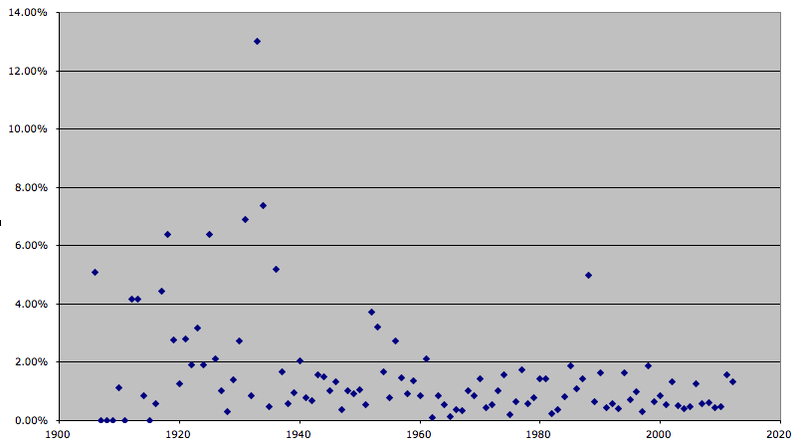 The HUGE spike is 1933, the year that saw the beginning of the Dust Bowl on the North American prairies. No surprise there. Those record highs parched the plains and the wind took care of the rest. The more recent spike in 1988, coincidentally [or maybe not] was the year Dr. James E. Hansen of NASA first testified to Congress [in June of that year] that global temperatures had risen beyond the range of natural variability. But consider this: before the post-WWII era of the automobile there was much stochastic variability in the new record temperatures each year. Since about 1950 the world’s consumption of fossil fuels has grown more than 400 percent, yet the graph above shows what seems to me to be a remarkable quiescence. Anyone with an idea as to why that would be is welcome to weigh in. It’s said that records were made to be broken. Perhaps that’s true. Don’t be buoyed by the idea. Despite the near absence of unusually high numbers of June temperature records since the 1950s, what we’re seeing in these data is evidence of a steady [and inexorable] advance in the maximum daily temperatures in the US and its territories. In a world that was metastable climatologically, you’d expect data such as these to hover around zero–some years positive, some neutral (since you wouldn’t record lower temperatures if you’re tracking higher temps). I see nothing hopeful in these data. Thanks to Iain Davidson for forcing me to look more closely at the data on record-high temperatures. It’s much clearer to me now that we’re in real trouble. And, from the slope of the trend line, we’re nowhere near equilibrating the world’s climate. It’s gonna be really bad down the road. As I said previously, wish us luck. This entry was posted in Global warming, record-breaking summer high temperatures, sea level. Bookmark the permalink. ← More than 1,000 temperature records broken in a week! Well it seems every night you listen to the weather report and it is either the coldest day/night since whenever or the warmest day/night since whenever. And it is either due to global warming or it is not. I am sceptical of a 250 year old climatic record, which is what we have in Australia, being of much use to understand a phenomena that seems to work on varying time scales that range for decades (for the El Nino/La Nina cycle to thousands of years (Ice Ages). I am sure that the climatologists have it right after all being an archaeologist we know how right science is all the time. Anyway it is a good thing not to pollute the environment in any event. Personally I watch the weather not for recordbreaking events but to see how wet I'll get on tomorrows morning walk! @IainS I think you're best to think long where climate is concerned. Rob, it would seem that by expanding the data set back another ~50 years that you're seeing greater scatter due to few observations from which to establish a record high, and also fewer stations, so any one record high accounts for a greater percentage of stations. If you have 15 stations, one of them recording a high is about 6.7% of stations; if you have 15000, one record is 0.0067%. Is this part of it? For a shorter record, normal variation will produce new record highs more frequently early on than later on (try rolling a pair of dice 100 times and record the frequency of rolling the highest total so far). It's for this reason that the flatness of the latter half of the scatter is worrisome, as you noted, since it should tail off if it was all just varying around a mean. But I'm not looking at the details of the data, so maybe I'm just blowing smoke. I once did the experiment of generating a series of random numbers in Excel and calculating the mean of those numbers. At first the mean jumps around a bit, but after a while it settles down to a fairly constant number (rather like a cricketer's batting average). I think that explains the randomness in the early years of the 20th Century–there just were not very many consistent records at all. I thought that the other factor that may be in play here is the accuracy of the observations. So, looking at the NOAA records, I was expecting that some of the new maxima were exceeding the previous one by say 0.1degree. But it would seem that the measurements are rounded to a whole degree. So then the interesting thing is that there are some new records that are 2degrees higher and some that are 1degree higher. If I was really bored (or getting paid to do it) I would look to see if there is any pattern there, but I suspect we want to have more accurate records. By the way, I admire your patience extracting all those data. Using percentages was about the only way I could 'norm' the data so the absolute number of records wasn't the sole datum. But you're dead right about the variability inherent in the smaller populations of observations towards the left. @Iain. I'm sure it would be more enlightening to see by how much these records are being broken as a function of time. But even without finer resolution, the picture is rather bleak, with the steady drumbeat of many hundreds to thousands of records being broken each year in just the month of June. Better clench your buttocks…it's goin' ta be a bumpy ride.